"Book One in The Peacock King Trilogy"
Gerald finds more than he bargained for during his spying mission in the Court when he finds his long-lost brother there. Entangled in a dangerous scheme that involves magic, slavery, and secret plans, will Gerald and his brother free the land itself from the grip of a tyrant, or will they fall under his spell? In the Court of the Peacock King has not been tagged yet. 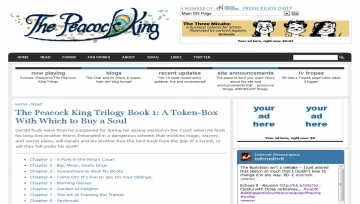 Help others find In the Court of the Peacock King by tagging it! In the Court of the Peacock King has not been reviewed yet. In the Court of the Peacock King has not been recommended yet.